There are roughly 640 muscles in the human body. Athletes spend an inordinate amount of time training and strengthening almost every single one of them. Yet there are six that are often forgotten: the Superior Oblique, Superior Rectus, Medial Rectus, Lateral Rectus, Inferior Rectus, and Inferior Oblique. Or, simply put: Your eyes. The aforementioned six muscles are the sextuplet that comprise your eyes, which are undoubtedly the most important – and often most ignored – muscles for an athlete. The vast majority of players train their eyes simply by playing, doing little else to strengthen the muscles that will predetermine every play and every action as all volleyball skills are visually guided task. Just as athletes perform hundreds of repetitions squatting and pressing and dead-lifting, we at Volleyball1on1 believe that you must also be strengthening your eyes. And we know the best techniques and have the best resources to do so. Our off the court training will improve visual muscle acuity on the court, including speed, endurance, strength and focus. Greater ability to reach the athletic “zone” which is a visually guided task. If you are a coach or player looking to improve your performance on the court, improving your vision or your teams vision may be the most effective step in doing just that. We are excited to announce the launch of our Peak Performance OODA Loop Vision Training Posters. These 27″ x 39″ posters are ideal for helping athletes in all sports including volleyball improve their ability to process visual information and thereby speed up their ability to navigate the OODA Loop. Athletes who can more effectively move through the OODA Loop while playing sports will experience improved ability to “read the game,” “slow down the ball,” “slow down the game,” and “deal with stress,” while playing sports, including volleyball. 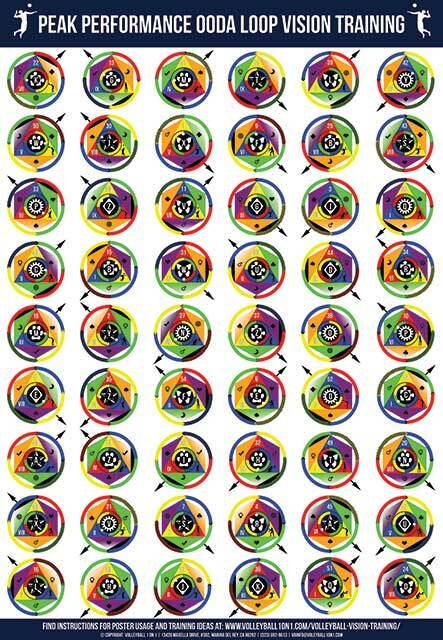 The visual training exercise using the posters involve athletes perform many complex tasks, including tracking moving objects, scanning for objects, and maintaining a stable image on the retina while performing different stages of the OODA Loop. The training exercises are broken down into 5 levels as players learn to more effectively move through the OODA Loop. Volleyball1on1 will be offering 8 Large Complimentary OODA Loop Volleyball Vision Training Posters at all High School and Club Camps we run this year. These posters are perfect for training in the gym or weight room. We also will be offering 2 mini posters to all summer camp attendees for use and training at home. Schedule a call with me, Founder of Volleyball1on1.com – Andor Gyulai.